On Thursday 8 May 2014 various civilian and military dignitaries from the Lille area gathered in front of the 'Melancolia', the municipal war memorial to remember V.E. Day (8 May) 1945 [Photograph No. 1]. The year 2014 was the 69th anniversary of the capitulation of Nazi Germany and ever since the end of the Second World War a service of commemoration has been held at Lille's War Memorial. Similar services are held at the municipal war memorials throughout France on 8 May each year which is a French public holiday. Floral tributes were placed in front of the memorial by the dignitaries, such as the Mayor of Lille (Mme. Martine Aubry), the Prefect of the 'Nord' department, the military governor of the district and military veterans. Some of these floral tributes can be seen in Photograph No. 2 (above). In recent years, some children from one of the local schools have been invited to help light a 'sacred flame' on a plinth temporarily placed in front of the memorial in honour of the 'Unknown Soldier'. In 2014, the children invited to undertake this task were from Lavoisier School, Wazemmes (a suburb of Lille). After the sacred flame had been lit the assembled crowd sang the 'Marseillaise' (the French National Anthem). Traditionally, Lille and the surrounding area has had a strong adherence to the Catholic faith. Given its historic location at the crossroads of a number of nation states there has also been a strong tradition of military service in and around the Lille area. Lille, for example, was the birthplace of General Charles de Gaulle, the Free French leader during the Second World War. However, until October 1913 Lille was part of the Archdiocese of Cambrai. In October 1913 Lille's Roman Catholic basilica, Notre Dame de la Treille, was raised to the status of a cathedral and became the centre of the new Roman Catholic diocese of Lille - a diocese which extended out to Dunkirk on the Channel coast. The area around Lille was under German occupation for most of the First World War (October 1914 to October 1918). The city was also occupied by the Germans for most of the Second World War (May 1940 - September 1944). During both these periods of occupation life for the civilian population of Lille was subject to many restrictions imposed by the occupiers. For the Catholic population of France, one of its important figures has been Joan of Arc (1412 - 1431) - in French "Jeanne d'Arc". She lived during a time when much of France was occupied by a 'foreign' power (which at that time was the English). It was Joan who was largely responsible for the reuniting of France under the French king, Charles VII. She was the figurehead who inspired the French recovery and ultimate victory in the Hundred Years War. The creation of a new diocese of Lille came in the aftermath of the 1905 French law on the Separation of the Churches and State. 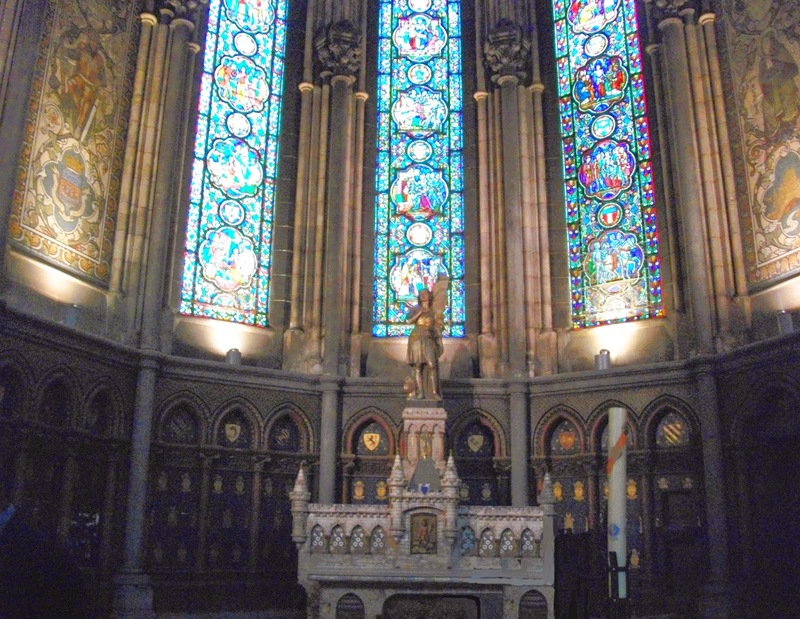 It was during the debate leading to this law, in 1904 / 1905, that a chapel dedicated to Joan of Arc was built and dedicated in what was then the basilica of Notre Dame de la Treille. The chapel can be seen above [Photograph No. 3]. Originally, this chapel had been planned to be under the patronage of St. Louis of France (1226 - 1270), the French Crusader king, Louis IX. But, with these political changes within France in taking place around the same time, it was decided by Canon Delassu, a royalist cleric at the basilica, to dedicate the chapel to Joan of Arc. She was a simple shepherdess who became a soldier and was thought to be a better choice to resist attacks upon the church by the secular French Republic. In retrospect Joan of Arc seems to be a strange choice. Indeed, at that time the church officially regarded her as a 'Venerable'. Because she was not an official 'saint' she did not have an official feast day. This explains the reason why the statue of Joan in the chapel is without a halo. Nevertheless, as a 'venerable' prayer cards were issued to encourage the faithful to pray to her for an intercession. In fact it was only in 1909 that Joan of Arc was beatified by the Catholic church in 1909 (i.e. when she was declared 'Blessed'). Her canonisation came only in 1920, after the First World War (i.e. she was thus officially declared a 'Saint'). Thus, in the years before the First World War, Joan of Arc was regarded by many Catholics in the Lille area as someone they could pray to for an intercession. This devotion to Joan of Arc in the Lille area was further reinforced during the German occupation of Lille in the First World War and again during the Second World War. By the time of the Second World War, St Joan of Arc had been declared a patroness of soldiers. She was also one of the secondary patron saints of France (St Denis being the principal patron saint of France). For most of the Catholic Church throughout the world the feast day of St Joan of Arc is 30 May: the date of her martyrdom. Yet, in her home country of France, after WW2 the French Catholic bishops declared the nearest Sunday to 8 May (the anniversary) of V.E. Day as the Feast Day of St Joan. The ceremonies in France each year on 8 May are those of the French state and the municipalities (i.e. the Republic of France). On the other hand, the feast day of St Joan of Arc on the nearest Sunday to 8 May is commemorated by the Catholic Church. In 2014, the nearest Sunday to 8 May fell on Sunday 11 May. At the cathedral at Lille, there was a procession to the chapel of St Joan, led by children carrying the cathedral banners followed by a short service of dedication [Photograph No. 4]. This included the 'Prayer of St Joan of Arc' for faith and the 'La Clochette' prayer for peace (see below). Both these prayers became widely popular during the First World War and again during the Second World War. The 'La Clochette' prayer for peace is better known in English as the 'Prayer of St Francis of Assissi'. It was famously paraphrased in front of No 10 Downing Street, London by Mrs Margaret Thatcher when she was first elected British Prime Minister in 1979. "St Joan, you were a timeless model for all men and women to follow. The impatience and frustration you showed with your generals and king shows your humanness that we can relate to in our own life and struggles. Help us in our daily life. You lived this statement to the fullest that 'Christianity can be preached only by living it'. Help us to do the same. I ask you for this special favour. Amen". Thanks to the office at the cathedral of Notre Dame de la Treille, Lille for information about St Joan of Arc and the cathedral's history.